Are you a registered Facebook (FB) user? Do you visit your FB wall regularly? If so, then you should be among those covered by the statistics on FB online penetration or reach and if you are a Filipino like me then we belong to the top heavy users of social media more specifically Facebook. US-based research firm comScore has crowned Filipinos as the world’s heaviest users of social media in terms of online penetration among countries around the world. 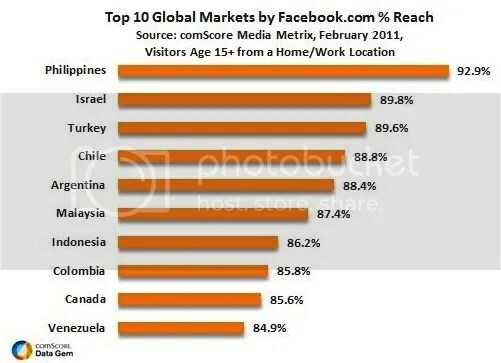 In terms of unique online visitors to Facebook.com, the report found that the Philippines emerged as the top market with nearly ninety-three (93%) percent of our online population visiting the social media site during the month of February 2011. Israel and Turkey followed, both seeing more than eighty-nine (89%) percent of their netizens frequenting the social networking site during the month. Our neighboring countries, Malaysia and Indonesia, were at sixth and seventh places, respectively, with 87.4-percent and with 86.2-percent penetration rates. Last year, comScore also released a study which showed the Philippines as having the highest penetration of social networking usage in the Asia Pacific region with ninety (90%) percent of Pinoy netizens spending their online time on Facebook. The report also said that Facebook has also toppled Google as the most common touchpoint for Internet users in the Philippines, with local folks spending an average of seven hours per month on the site. The Pinoys was, however, not as prominent in the micro-blogging site Twitter as it placed only eighth worldwide in the usage rankings. Now that Facebook had outscored Google as the top website getting opened by Pinoys when they get online, is it time for i-cafés to make it the default homepage for their workstations? I distinctly remember that when we had our i-café, we always had Google Search as homepage in our computers. When our I-Cafe business managed by my second son was still operating, Facebook was totally unknown to this non-techie senior citizen. The social networking sites I had then was Friendster and Twitter which I tried for the heck. Email was my usual means of speedy communication whether for business or personal. When I got my FB account, I got hooked and started mostly with my colleagues in ICAM (Internet Cafe Association of Marikina). Later on, friends of friends came along that sometimes I felt bewildered and wondered if I really knew them. When my eldest son’s friends, colleagues in his former job hereabouts and his wife’s mistook me for him (he’s my junior), I had to make frequent reminders of mistaken identity. After I posted my photo, no more mistaken identity. FB games I never played as messaging is most appealing including razzing my ICAM friends who treat me as a father-figure. I really enjoy FB. I’m always online at Facebook….the page is always on even while I’m surfing other sites. ← Broadband Service: Utility Or VAS?